The most important cultural practice associated with maintaining any turfgrass is mowing. When part of the grass plant’s leaf system is removed by mowing, the plant reacts by using high amounts of carbohydrates to replace the leaves that were cut off. Only when the leaves are replaced do the roots and stems start growing again. The greater amount of leaf surface that is cut off at each mowing, the longer root and stem growth is delayed. Research found that when no more than 1/3 of the leaf system is removed per cutting, the negative effect on root and stem growth is minimal. The cutting height has an effect on root size. There is a direct relationship between cutting height and the total volume of root system. Some grasses, like Bermudagrass, can tolerate being mowed very low, but all grasses do better with more leaf surface left to collect sunlight. Don't over water and don't mow wet turf! Get rid of the grass catcher. Grass clippings should be left on the turf. They do not contribute to thatch. They feed the microbes and are nothing but beneficial. Clippings should only be caught and moved to the compost pile when scalping prior to overseeding in the fall. If you don’t choose to overseed, that’s fine, I don’t do it either. Edge along walks and curbs as needed. Monofilament trimmers can also be used along steel edging and other hard surfaces, but they should never be used around trees or shrubs. The damage is fast and severe. Weed control products are divided into two groups - those that kill weed seed as they germinate (pre-emergent herbicides) and those that control weeds after they are growing (post-emergent herbicides). The organic pre-emergents are corn gluten meal and mustard meal. The organic post-emergents are vinegar and fatty acid products. Pre-emergent herbicides must be in place before the weed seed begins to grow. Annuals like grass burs and crabgrass that germinate from seed every year are controlled by these products. For a pre-emergent herbicide to be effective, it should be applied before the weed seeds germinate. Post emergent control of weeds is done in the organic program primarily with fatty acid and vinegar-based products. Spray during warm or hot weather. Straight vinegar (10% - not 20%) can be used or vinegar-based products. Scythe is a currently available fatty acid product. Others are on the way. Mow a little higher than normal. Start the season at 1 1/2" to 2" and raise to at least 3" by mid summer. 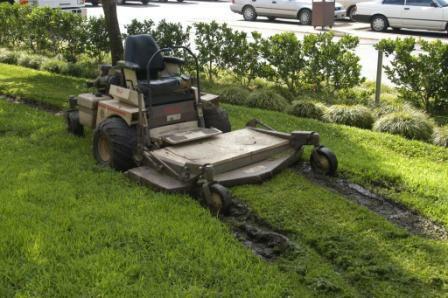 Mow weekly or more often if necessary, leaving the clippings on the lawn. Put occasional excess clippings in the compost pile. Do not send clippings to the dump. Do not use line trimmers around trees. Do not scalp the lawn in the spring. Scalping is hard on equipment, exposes the soil to sunlight and weed germination, and wastes organic matter. Stop using synthetic salt fertilizers and enjoy the ease of the natural organic program.